Keep your countertop clean and convenient with a serving bar. 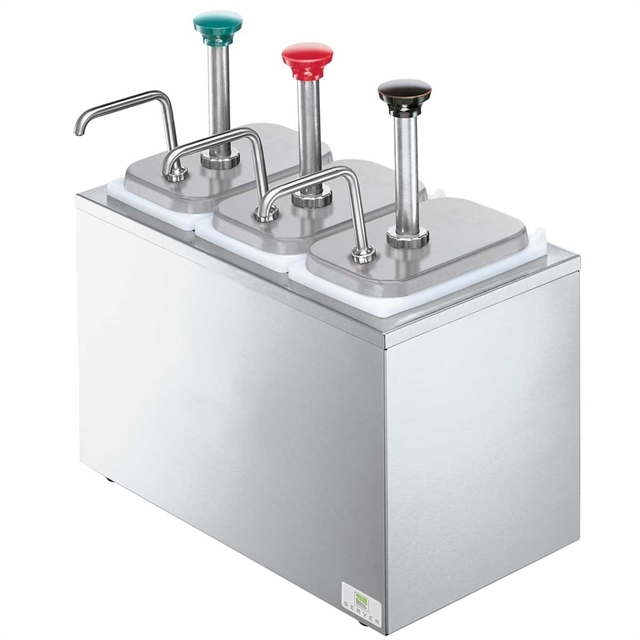 The SB-3 includes three stainless steel condiment pumps 83330 and three deep plastic fountain jars 82557. The stainless steel bar has a brushed finish to reduce the visibility of fingerprints. Insulated Serving Bars may be cooled with one Eutectic Ice pack per jar, HOLDCOLD™ Jars or ice. The CP-F stainless steel condiment pump is ideal for dispensing just about any condiment or dressing, including those with larger chunks such as tarter sauce and Thousand Island dressing directly from a standard deep fountain jar--stainless steel or plastic. Maximum stroke yields 1¼-oz (37 mL). Adjusting portion control is made easy with the supplied gauging collars. Collars reduce portions in ¼-oz. (7mL) increments. Colored engraved knobs are available to identify flavors.